Dishes chicken wings are easy to prepare and affordable. The wings can be boiled, to roast, to bake, to cook battered. Roast them convenient to take to work or on the road. Fry chicken wings and you get a great dish for lunch or dinner. Honey wings. Wash 1 kg chicken wings under running water. Remove pin feathers if they are on the wingsH. Make a marinade. To do this, mix 1 tablespoon of liquid honey 0.5 Cup soy sauce 0.5 St. l. curry. Curry you can substitute any spice according to your taste. Mix the marinade until smooth. Add in the marinade a few tablespoons of vegetable oil. Whisk all to connect oil with the honey and soy sauce. Put the chicken wings in a pan with the marinade and with your hands mix them. Each wing should be completely covered with marinade. Cover the bowl and put the wings overnight in the fridge to marinate. During this time, a few times with a spoon stir the wingsto better marinated. 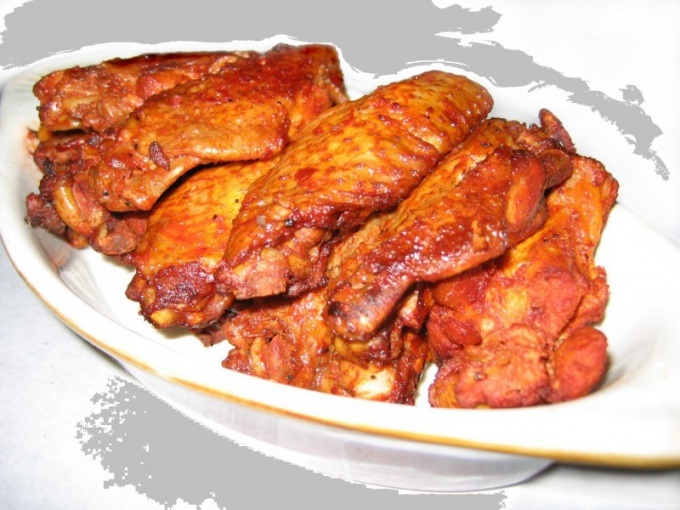 Place chicken wings on a baking sheet and put them in the oven, preheated to 150 degrees. Fry the wings in about an hour. Serve chicken wings with honey glaze on a table hot or cold. Chicken wings in batter. 0.5 kg chicken wings wash, put in a saucepan and add water just to cover the wings. Cover the pan and place it over high heat. Bring contents of saucepan to a boil, reduce heat. Cook the wings until cooked on a slow fire. 10 minutes before the end of cooking, salt the broth to taste. Put the finished cooked wings on a plate and dry them with a paper towel. Then RUB each wing spicy red pepper. Prepare the batter. 2 eggs, whisk with 100 g of beer. Portions add 4 tablespoons of flour and stir until all lumps disappear. Dip each wing in batter and fry in hot vegetable oil to a delicious Golden brown. Place fried wings on paper towel to remove excess fat. Serve fried chicken wings on the table with vegetable salad.